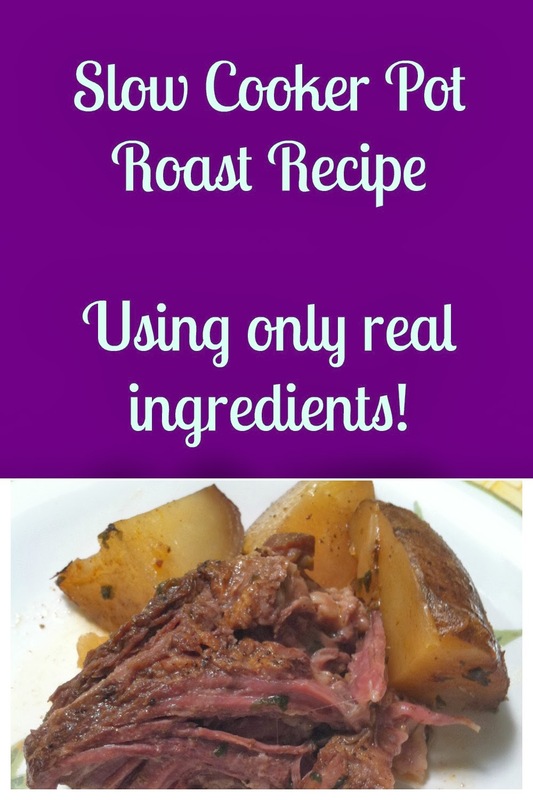 My husband loves pot roast, and I'm a huge fan as well. Normally when I make a pot roast, I make it Mexican style in a slow cooker. But even though I've done my best to make that meal without anything processed, I cannot get good fresh tomatoes or hatch chilies this time of year which means I need at least one canned item for that recipe. Since we are doing our no processed food eating again, I needed another game plan. I decided to finally think about how I was going to cook this pot roast exactly when I was pulling it out to put it into the Crock Pot. I decided to wing it and make what I thought would taste good. In a very unAllison like fashion I decided to measure everything and write it down as I was making this recipe up just in case it was good so I could recreate it. My husband still doesn't believe that I measured the spices but I did, promise. Yes it cramped my style in case you are wondering. I have to say that this was hands down the BEST pot roast I have ever made! It was tender and flavorful and the perfect meal for our freezing cold night. I bought a small roast so make sure you adjust the recipe according to your size. Brett who only likes the Mexican style pot roast said that this pot roast was not only better, but it is the best thing I've made in a long time. High praise from a man who says his favorite meal is my Mexican style pot roast. It only takes a few minutes to pull it together which of course is almost the best part. 1. Trim your roast. I bought a sirloin roast which is much leaner than your traditional pot roast. But you want to get as much fat off the outside of the roast as possible. 2. Heat a large skillet or cast iron pan on high heat. 3. Generously sprinkle the roast with salt and pepper. 4. Add olive oil to your pan and heat the oil. 5. Place the roast in the pan to sear it on each side. You want a nice brown crust on both sides. About 2-3 minutes per side. 6. While your meat sears, mix the onion powder, parsley, garlic, and paprika in a small bowl. And quarter the onion half and cut the potatoes into 8ths. 7. Pour the water into a 5 quart slow cooker. Place the roast in the crock pot with all the drippings from the pan. 8. Sprinkle 3/4 of the spices over the top of the roast. 9. Place the onion and potatoes around the roast and top the vegetables with the remaining seasoning. 10. Cook on low for 8 hours and enjoy! I love using my crock pot to cook my roasts. I seal it in with a layer plastic wrap and a layer of foil followed by the top to keep all the juices and aroma in. It comes out so tender and flavorful! Hi, Allison! This looks so yummy and so easy to make! Thank you for linking it up with Nomday Monday! Have a great day!